Please refer to our stock # 285 * when inquiring. 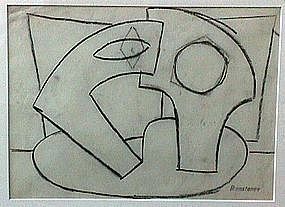 Abstract charcoal on paper - estate stamped 'Ramstonev'. This work was done during the late 1930's as part of the 'Cooperative' project in the New Hope, Pa. modern art community. Charles Ramsey, Louis Stone and Charles Evans worked collectively on many drawings and paintings during this time. While all three were accomplished artists they decided to suppress their individual egos and create works in keeping with the leftist philosophies proposed by many of the intellectuals of the time and the socialist leanings of Charles Ramsey. These unique pieces were made for a short period from 1938 to 1939. They are scarce and stand as exciting examples of what was a unique experiment in American Modernist Fine Art. This work is framed, in very good condition and measures app. 17 1/2" X 23 1/4".